New artist Monica Fairbairn joins Karenna Maraj Jewelry Designs! Fun chunky necklaces by Monica Fairbairn perfect for Spring. 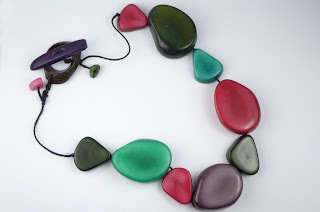 Monica uses colorful dyed Tagua Nuts from Ecuador and sterling silver to create unique pieces to complement any outfit.